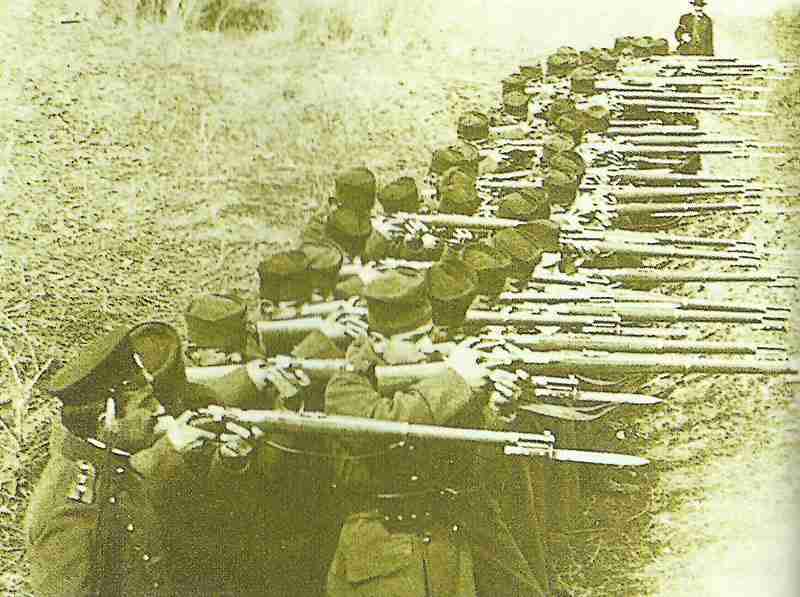 Serbian Line Infantry ready to fire. The picture dates from the previous year and is from the Second Balkan War of 1913. Belgium: Retreat of Belgian Army from river Gette on Antwerp after defeat at Aerschot by Kluck. Germans enter Louvain and shoot 150 civilians at Aerschot, one of many – often unconfirmed – reports of atrocities committed against non-combatants. It is known that the Germans after the bad experience from 1870-71 in France openly avow the policy of ‘frightfulness’ to cow and intimidate the local population in occupied areas. Siege of Namur: (until August 25) 27,000 garrison with 9 forts face Gallwitz’s 5 divisions. Alsace: ­French again take Mulhouse. Pau captures 1,000 PoWs and 24 guns at Dornach, but simultaneous French reverses at Morhange and Saarbourg (Belgium) necessitate abandonment of entire operation. Lorraine: Joffre forms Maunoury’s Lorraine Army of reserve divisions (until August 25). East Prussia: Samsonov’s Second Army invades from south. On Rennenkampf’s northern flank 3rd Squadron of Russian Horse Guards charge and take 2 German guns at Kauschen. Poland: ­Dankl’s advance checked near Kielce, but Russians evacuate on August 22. Pacific: Australian New Guinea Expedition sails from Sydney, arrives at Port Moresby on September 4. First RFC reconnaissance mission to cross German Lines. Captain (later ACM Sir P.) Joubert de la Ferte in Bleriot and Lieutenant Mapplebeck in BE2a. Greece: The government offers to attack Gallipoli Peninsula under British command, but British rejects as it might precipitate Turkey’s entry into war. India: Indian Expedition Force ‘C’ first unit, the 29th Punjabis, sails for East Africa. It’s the first Indian Army unit to go overseas. France: Miners working day extended to 11 hours. Lake Nyasa: 3 British steamers land 400 soldiers of Kings African Rifles at Vua. USA: Wilson Senate speech appeals to Americans to be ‘neutral in fact as well as in name’.